UPDATED: Mon., July 16, 2018, 10:57 a.m.
HELSINKI – President Donald Trump and Russian President Vladimir Putin met here Monday for their first formal one-on-one summit, firmly shaking hands hours after Trump began the day by blaming his own country, rather than Russia, for the hostilities between their two nations. Trump said he and Putin have a “lot of good things to talk about, and things to talk about,” including trade, military issues, nuclear proliferation and China, in particular their “mutual friend,” Chinese President Xi Jinping. Trump did not mention Russia’s interference in the 2016 presidential campaign as one of the topics to be discussed. The meeting began later than originally planned, after the perennially tardy Putin arrived in Helsinki well behind schedule, keeping Trump waiting. Trump is facing immense pressure to aggressively confront Putin over Russia’s election interference, especially after the Justice Department indicted 12 Russian intelligence officials Friday and charged them with hacking and stealing Democratic emails, as part of a broad subterfuge operation that U.S. intelligence agencies believe was ordered by Putin to help elect Trump. Trump – who has been reticent to criticize Putin and has said he admires the Russian autocrat’s leadership style and strongman image – began their meeting shortly after 2 p.m. (7 a.m. Eastern time) at the Presidential Palace, a neoclassical residence facing Helsinki’s heavily touristed Baltic Sea waterfront. They were originally scheduled to meet at 1 p.m. here (6 a.m. ET). But Putin arrived later than expected in Helsinki on Monday and did not disembark from his plane until after 1 p.m., delaying the scheduled start time of the summit. Putin is known for his frequent tardiness; he once made President Barack Obama wait 45 minutes for one of their meetings. The two leaders first were meeting alone, with interpreters present but without their advisers, for 90 minutes. They then will be joined by their delegations for a working lunch, followed by a joint press availability. Trump then will fly home to Washington. Trump is joined in Helsinki by Secretary of State Mike Pompeo, national security adviser John Bolton, chief of staff John F. Kelly and other advisers, including National Security Council Russia expert Fiona Hill. Earlier in his Europe trip, Trump told reporters he would raise the election interference issue with Putin, although he indicated that he would not be too stern, saying he assumes Putin will deny responsibility, and then they would move on to other topics. In another Monday morning tweet, Trump sought to pin blame for the matter on Obama. “President Obama thought that Crooked Hillary was going to win the election, so when he was informed by the FBI about Russian Meddling, he said it couldn’t happen, was no big deal, & did NOTHING about it. When I won it became a big deal and the Rigged Witch Hunt headed by Strzok!” Trump wrote, referencing first 2016 Democratic presidential nominee Hillary Clinton and then FBI agent Peter Strzok, who testified before Congress in a combative hearing last week. Trump arrived with first lady Melania Trump in Helsinki late Sunday, after spending the weekend golfing at his property in Scotland. Aboard Air Force One, the president aired some of his grievances on Twitter ahead of his upcoming summit with Putin. “Unfortunately, no matter how well I do at the Summit, if I was given the great city of Moscow as retribution for all of the sins and evils committed by Russia over the years, I would return to criticism that it wasn’t good enough – that I should have gotten Saint Petersburg in addition!” Trump wrote. Putin had been set to land in Helsinki around noon local time with fresh momentum after presiding over the World Cup final in Moscow, a tournament that many observers – including Trump – hailed as a success. Beyond spreading a positive image of Russia, the World Cup also gave Putin a chance to exercise his diplomatic chops ahead of the Helsinki summit amid a revolving door of visiting world leaders. On Sunday alone, Putin met with French President Emmanuel Macron; Hungarian Prime Minister Viktor Orban; Croatian President Kolinda Grabar-Kitarovic; and Emir of Qatar Tamim bin Hamad al-Thani. Last week, Putin separately received Israeli Prime Minister Benjamin Netanyahu and Ali Akbar Velayati, a top adviser to Iran’s supreme leader, Ayatollah Ali Khamenei, stoking speculation that Putin would discuss Iran’s presence in Syria with Trump. Russian officials have kept expectations low, emphasizing that the very fact of the meeting is an important step forward after years of tensions between Moscow and Washington. Ahead the summit, Putin spokesman Dmitry Peskov praised Trump’s pragmatism in an interview with pro-Kremlin broadcaster RT. For Putin, the setting of the summit provides something of a home-turf advantage. Although Finland is a member of the European Union and is a neutral nation, it borders Russia and is familiar to Putin, as Helsinki is just up the Bay of Finland from his hometown of St. Petersburg. This vibrant Nordic capital, which in the summertime glistens with sunlight late into the evening, holds significant resonance for U.S.-Russia affairs as a neutral site for leaders of the two countries to meet. In 1990, then-President George H.W. Bush met in Helsinki with then-Soviet leader Mikhail Gorbachev to show a unified front against then-Iraqi President Saddam Hussein amid escalating tensions in the Persian Gulf. And in 1997, then-President Bill Clinton and then-Russian President Boris Yeltsin held a two-day summit here to discuss arms control and the addition of former Soviet countries to NATO. Trump has said he has low expectations for Monday’s summit with Putin and heads into it without the kind of pre-scripted outcomes typical at such international meetings. Rather, he sees the meeting as a chance to build a better rapport with Putin and foster warmer relations between the United States and Russia. Trump and his advisers have sought to temper expectations for the summit, which is expected to include discussions over the ongoing conflicts in Syria and Ukraine, a Reagan-era arms-control agreement and the prospect of extending a 2011 nuclear arms reduction treaty with Russia. Back in Washington, lawmakers from both parties have implored Trump to aggressively confront Putin. “President Trump should have only one message for Putin on Monday: Quit messing with America,” Sen. Ben Sasse, R-Neb., said on Twitter early Monday, arguing that Trump should not be “dignifying” the Russian president by granting a meeting. Putin’s allies say that last Friday’s indictments represented the latest effort by the Washington establishment to derail Trump’s effort to improve relations with Russia. 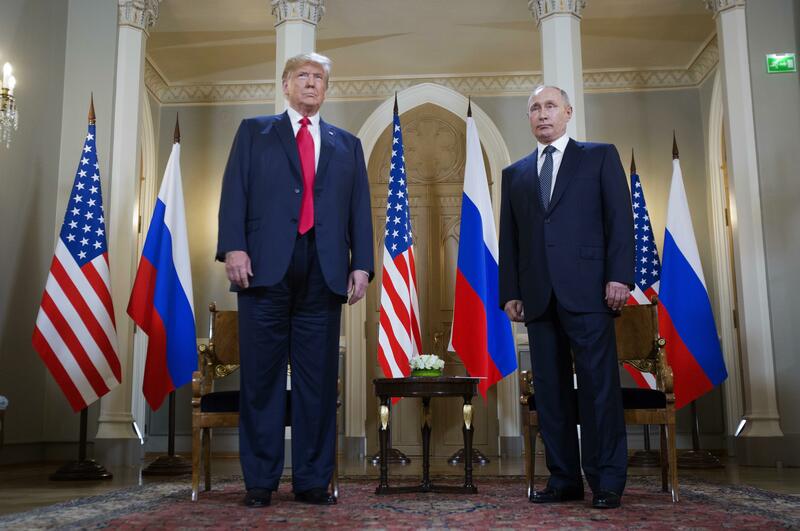 “It seems to us the opponents of the improvement of U.S.-Russia relations should not be allowed to endlessly exploit this harmful topic, which is being kept afloat artificially,” Putin’s foreign policy adviser Yuri Ushakov said ahead of the summit, according to Interfax. Published: July 16, 2018, 6:34 a.m. Updated: July 16, 2018, 10:57 a.m.